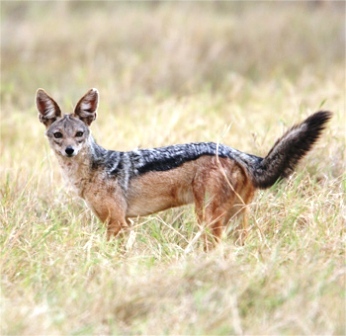 The Black backed Jackal, Canis mesomelas, is another of the dogfamily that pairs for life. The young are reared by both parents and they hunt together in family parties. Jackals are opportunistic feeders who are equally at home hunting small antelope or scavenging at larger kills. Around human settlements they can become a nuisance as they will steal anything edible including new born livestock (goats, sheep etc). Although primarily carnivorous they will also eat fruit and berries.